The expression is your handy answer if you want to know how many veterans the Tigers will trade, which starting pitcher the Rays will deal, whether the White Sox will move Chris Sale or Jose Quintana. It also is the answer if you want to know how strongly the Oakland Athletics will consider trading right-hander Sonny Gray, catcher Steven Vogt and left-handed reliever Sean Doolittle. The A’s are not shopping any of those players, according to major-league sources — heavens, no, teams never shop players, they only listen! A’s officials, however, recognize that the team is unlikely to compete for the AL West title in 2017, leaving them open-minded to trade proposals for their top players. 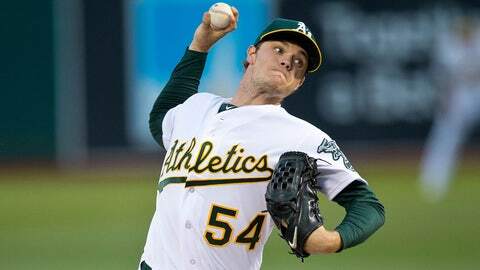 The A’s intend to build around a core of talented young starting pitchers — Sean Manaea, Jharel Cotton, et al. The goal of any trade would be to add players at the same level of service or below, increasing the team’s depth going forward. 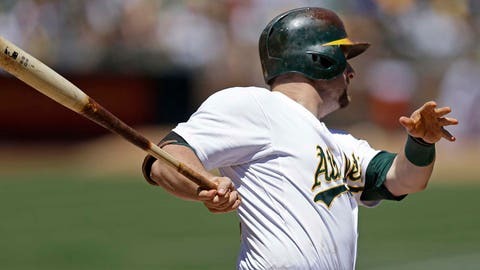 Gray, 27, and Vogt, 32, both are under club control for three more seasons through salary arbitration. Doolittle, 30, is under contract for $2.6 million next season and $4.35 million in 2018, with options of $6 million and $6.5 million in the two seasons after that. The Athletics, even in a thin market for starting pitching, probably would not want to sell low on Gray, who is coming off his worst season, including two trips to the disabled list. Vogt also was not at his best in ’16, but still has value — his .711 OPS was the same as free-agent catcher Matt Wieters’. Doolittle, meanwhile, could be the prize of the group, considering the contracts that Aroldis Chapman, Kenley Jansen and Mark Melancon are expected to command in free agency. True, Doolittle missed more than two months with a strained shoulder. But he gradually increased his velocity after returning on Sept. 2, averaging 95 mph in his final four outings. The A’s can hold him until the non-waiver deadline, gambling that his trade value will only increase, along with Gray’s and Vogt’s. Or they can act on one or all of them this offseason, continuing a process they started with their trade of left-hander Rich Hill and outfielder Josh Reddick to the Dodgers for Cotton, lefty Frankie Montas and righty Grant Holmes on Aug. 1. Depends upon what the market will bear. The Rangers want to add a starting pitcher, but don’t expect them to renew their pursuit of the Rays’ available starters: Chris Archer, Jake Odorizzi and Drew Smyly. The teams had extensive trade discussions before the non-waiver deadline, but the Rangers chose a different direction, sending three prospects to the Brewers for catcher Jonathan Lucroy and reliever Jeremy Jeffress. That deal — plus the trade of five prospects for left-hander Cole Hamels and reliever Jake Diekman at the 2015 deadline — left the Rangers more protective of their remaining youngsters. The Rangers also do not appear as motivated as other clubs on free-agent starters such as lefty Rich Hill, leaving them likely to add a mid- to bottom-of-the rotation type in some fashion. One GM noted a difference in this year’s trade market, saying, “no team is pushing the reset button” — in other words, entering a full rebuild. The Braves, Phillies and Brewers took deliberate steps back last offseason, drawing accusations of “tanking.” The White Sox and Tigers, on the other hand, figure to retreat, but not to such a dramatic extent. Right fielder Adam Eaton, under club control for five more seasons at below-market salaries, is a good example of the difficult choices the White Sox face. Eaton, who turns 28 on Dec. 6, could be part of the Sox’s next contending team. But by the time the Sox are good again, he also might be in decline. 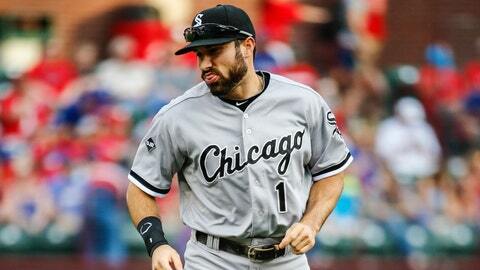 It might be best for the White Sox to act now when his value is peaking. ● At least for now, the Diamondbacks’ new management team seems content to keep Yasmany Tomas, who hit 31 homers and had an .820 OPS last season but still rated as a -0.1 in Fangraphs' Wins Above Replacement due to his poor defense in the outfield. Tomas, who turns 26 on Monday, is clearly more of an American League player, and will earn $48.5 million over the next four seasons if he exercises his combined $32.5 million player option for 2019 and ’20. Those numbers should look more attractive to AL clubs once Yoenis Cespedes and Edwin Encarnacion sign lucrative free-agent contracts. ● I mentioned in my previous column that the Rays might find it difficult to get the prospects they want for third baseman Evan Longoria, who is owed $94 million over the next six seasons. Some teams would contend that Longoria, from his age 31 to 36 seasons, would not offer enough surplus value for teams to part with premium talent. 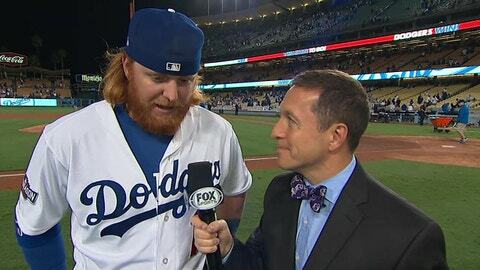 Then again, signing free-agent third baseman Justin Turner, who turns 32 on Nov. 23, also would come at a high price). Turner, in addition to his contract, will cost his signing team a first-round selection, or deprive the Dodgers of a compensation pick if they re-sign him. ● The Angels’ plan to stretch out right-hander JC Ramirez as a starter in spring training makes sense for a team seeking creative solutions to a depleted rotation. Ramirez, 28, has not started since 2011, but he pitched well for the Angels after they claimed him from the Reds last June. He doesn’t generate high strikeout rates, but the Angels see him as a physical, 6-foot-4, 250-pound sinker-baller who throws enough strikes to possibly succeed as a starter. Angels GM Billy Eppler was with the Yankees when that club used righty Adam Warren as both a starter and reliever in 2015, with impressive results. At worst, the Angels always can return Ramirez to the bullpen.